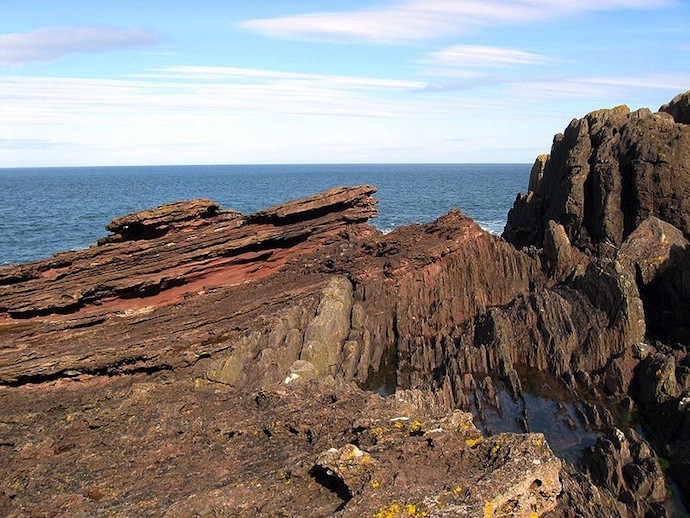 If geology has a shrine, it is Siccar Point, on the east coast of Scotland. The top layers are a reddish sandstone, sloping at an angle of about 20 degrees. Immediately under those top strata are nearly vertical layers of grey sandstone. Physician and scientist James Hutton, one of the fathers of modern geology, saw this outcropping and recognized it as a refutation of Biblical time and the idea that Noah’s Flood was the cause of geological phenomena. In its way, the outcropping at Siccar Point is as important to modern science as were Darwin’s Finches in the Galapagos Islands. Layered sandstone implies running water, a river or a stream. That implies a fairly steep gradient, which means eroding mountains. Sure, there is sand at beaches, too, and in deserts, but it doesn’t have the bedding or layers seen here. So the reddish sandstone on top means that there were mountains that eroded to sand, those layers of sand were themselves buried deeply enough for pressure and temperature to compress them to rock, and then were uplifted and exposed by erosion. That implies a lot of time. The older, grey sandstone – generally, younger rocks are on top – is also layered, but is composed of quite a different kind of sand. That implies still earlier erosion of some different mountains. The grey sandstone was similarly laid down, buried, compressed to rock, twisted from horizontal to vertical alignment, and exposed by erosion. All before the red sands washed down from their mountains. Two erosional events, with time enough between for the sands from the first to be pressed to rock, and then be re-exposed. Not all that far from Siccar Point is Hadrian’s Wall, the rock wall across Britain built by the Romans 2,000 years earlier. Hutton could see that 2,000 years hadn’t changed Hadrian’s Wall very much. The 6,000 years that Bishop Ussher claimed the Bible allowed since creation of the Earth simply could not support the time necessary to create Siccar Point. Just as a single, epochal Noah’s Flood could not have created both elements of the outcropping. Hutton recognized that the Biblical account of creation was false, Noah’s Flood was not the primary cause of the Earth’s topography and that the age of the Earth was measured in millions of years, not thousands of years. Since Hutton’s great insight, the top layer has been identified as Devonian Old Red Sandstone, approximately 325 million years old. The near vertical layers immediately below it are 425 million year old Silurian greywacke. Where the two layers meet, a hair-wide line jumps 80 million years, a much longer period than the time since the extinction of the dinosaurs at the end of the Cretaceous. It’s called an angular unconformity. The “unconformity” means there is a break in the orderly sequence of rocks, that some geological force like erosion moved away part of the history. The “angular” part means that the rocks meet at an angle, instead of in their original, horizontal beds. Hutton’s ideas were first announced in lectures in 1785 and published in 1788. They were immediately attacked as – wait for it – atheistic and blasphemous. It’s a sad commentary that 227 years later, a major political party in the United States still denies Hutton’s long-since proven perceptions. But Siccar Point is still there, a silent rebuttal to Christianists, for those who, like Hutton, can observe and draw conclusions. Does the shaping, and the obvious location, suggest that water was the weight that served as sculptor of both directions of the angular formations? If it was some other mass, is there anything to suggest what happened to the overburden (if not glacial melting) that brought about the erosion? The size of the grains composing the sandstones tell geologists a lot about the source rock, the kind of erosion, the characteristics of the stream doing the erosion and the velocity of the water. As a simple example, larger grains of sand are only transported by rapidly moving water; in slower water they fall to the bottom. The size of the grains, in combination with the kind of rock, tell you whether it is glacial erosion or liquid water. When there are layers – the red sandstone has alternating layers of coarse red sand and darker, finer grained sand – it tells you that conditions changed. And in every case, the original bedding was less than 2% grade, or the sand grains wouldn’t have fallen out. By contrast, the absence of clays means that there was enough current to continue to carry the bulk of the finer material along. Burial depth, when the sand was pressed into sandstone, can be teased out, as can the temperature at which it occurred. If there are iron particles present, the orientation of the original rock can be teased out by magnetics. The red sandstone is generally coarser, and less well compressed. It was buried more shallowly after being laid down, but still deep enough to concrete to rock. The grey sandstone, technically graywacke, is more complex, and more difficult to evaluate because of its greater age. There are turbidites present, mixed pockets of sand and mud, concreted to rock. Water is rarely a significant factor in compressing sand and sediments to rock. Water has a density of 1.0; even comparatively light rocks have densities of 4 – 5. Bottom samples from the Marinas Trench, the deepest known spot in the oceans, are soft mud. The stuff formerly on top is mostly gone. What’s there now, in areas where the red sandstone isn’t exposed, probably isn’t the original stuff; all of Scotland was under ice many times during the Ice Age. I don’t think there is even a clear idea of how thick the red sandstone was originally. 80 million years is a long time. Note for Real Geologists: Yes, I have simplified a lot.